The latest EAP appears to have broken the maven tab. It no longer shows the artifacts' names in the maven tab, but shows their artifactIds instead. Is there a new config option that I'm missing? Or is it just broken? It's a feature. See http://youtrack.jetbrains.com/issue/IDEA-95726 There is option 'Always show artifactId' it's enabled by default. Do you think that that option should be disabled by default? I assert that your feature is a bug because it changes long established behavior without warning. An option is fine, but an *option* it must be. And by default, it should probably be turned off so that the long established behavior does not appear to have changed without warning. PS - I can find no such option to modify. Where should I be looking? 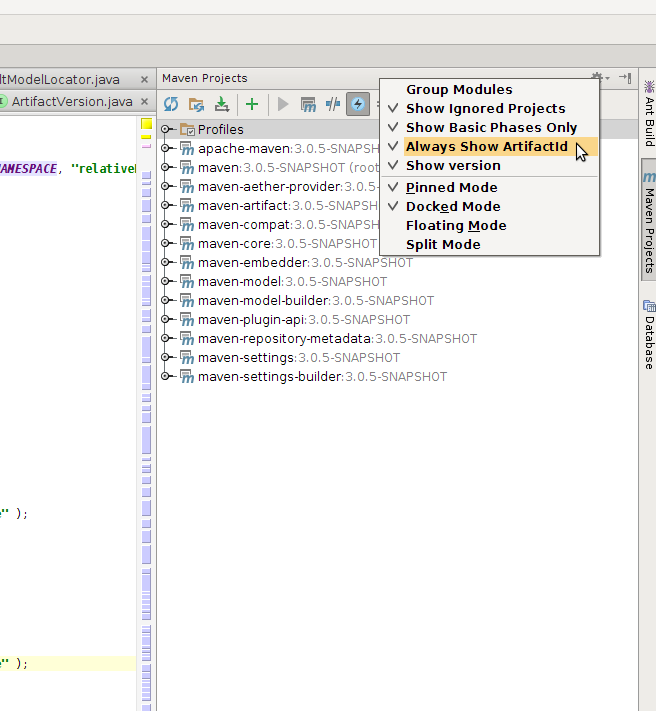 I forgot about that menu, was expecting to see it in the Maven project settings. PS - I still think it is a bug to change behavior on existing (already configured) projects without warning.